SILVENT 4015-LF is a unique product that combines highly concentrated blowing force with an easily maneuverable valve construction and low sound level. 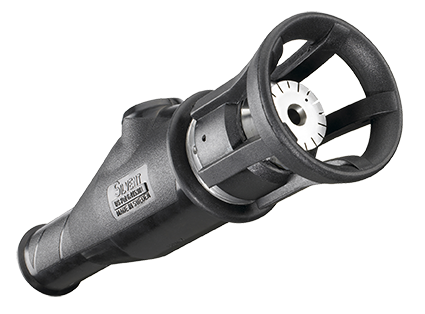 The patented nozzle design with a Laval orifice in the center surrounded by a ring of slots generates a low-turbulence air stream, which means a low sound level with no sacrifice of blowing force. The nozzle is made of stainless steel, making it suitable for use in practically any environment where extra high blowing force is required, e.g. the paper and manufacturing industries, steel mills etc. This air bazooka features adjustable blowing force that is easily regulated to any strength between 0 and 100 %. Fully complies with EU Machine Directive noise limitations and OSHA safety regulations. The 4000 series is available with two different extension pipes. Custom lengths are available upon request. Choosing the right length is important to attain maximum safety and the best working posture. Specify the length of the extension pipe you require last in the order number. Safety gun-extension pipe length: e.g. 4015-LF-1000.